Bamboo has great potential as a farm crop in the Southern US. Although the market for fresh bamboo shoots is still developing in this country, it represents the most immediate marketing opportunity for farms looking to integrate bamboo into their operations. Specifically, research and marketing efforts in the Pacific Northwest have demonstrated that bamboo shoots can be a valuable addition to farmstand sales and are also in demand by Asian and other fine dining restaurants. As with most vegetables, fresh bamboo shoots are much better and more nutritious than their canned counterparts. Other short-term marketing opportunities for bamboo include cut poles, live plants, and value-added bamboo crafts. Bamboo plantings can also provide an almost unlimited supply of plant stakes and poles for a variety of farm projects, plus windbreak, erosion control, livestock fodder, shade, wildlife habitat, and beauty. As our friend and bamboo mentor Adam Turtle says, "Bamboo gives you lots of options." It is our opinion that bamboo should have a place on any farm that is truly interested in pursuing sustainable agriculture. Beyond the market for shoots, plants, and crafting material, the market for industrial uses ranging from pulp to textilles to construction materials and other products represents a huge untapped potential for bamboo as a domestic farm crop. Unfortunately, the United States lags far behind Asian and Latin American countries in bamboo utilization. China's culture in particular has a long, symbiotic history of growing and using bamboo for almost everything, owing to their vast native stands of Moso (Phyllostachys edulis) and other large timber bamboos of the Phyllostachys genus. Most of the bamboo flooring and other bamboo products presently available in our country are either made in China or use Chinese-grown bamboo. However, there is no reason why the US can't produce its own bamboo products made from domestically-grown bamboo. The southern US is particularly well-suited for growing many species of useful bamboo, including Moso and Japanese Timber Bamboo (Phyllostachys bambusoides). As the dominant agricultural paradigm of growing vast monocrops of annual plants which rely on huge chemical and petro-inputs is revealed to be increasingly unsustainable and environmentally harmful, we humans will have to turn to more sustainable and earth-friendly crops if we want to continue inhabiting the planet. Since bamboo is a perennial, it only needs to be planted once and can provide a yearly harvest of shoots, poles, and plants in addition to its many other environmental and aesthetic benefits. Bamboo can be grown without expensive and polluting chemicals and pesticides and, with proper siting and species choice, generally requires little to no supplemental irrigation in the Southern US. What other crop can feed, clothe, and shelter us while protecting and improving soil, air, and water quality – all from a one-time planting? The logic of growing bamboo as a farm crop also stands up well against the other commonly subsidized long-term crop in the Southern US: pine trees. Tests at Auburn University comparing bamboo production to pine production began in the 1930s and continued through the 1960s. Although the research was unfortunately discontinued for reasons not entirely clear, results showed that bamboo greatly out-produced loblolly pine in terms of dry wood tonnage per acre. A summary of this study can be found at www.ag.auburn.edu/hort/landscape/bamboo.html#intro. Compared to pine plantations, a well-managed stand of bamboo can be harvested yearly after the initial establishment period, which will vary according to species, site factors, and end-use, but in any case should be sooner than the typical 10-15 years before the first thinning of planted pines. Although pines may be managed for a perpetually sustainable harvest, they are typically thinned every several years until a final clear-cut and replanting at around 30 years of age. With bamboo, there is no need to replant after 30 years and the harvest is YEARLY instead of every 5 years. While we recognize the value of pine trees to our native ecosystems, there is nothing sustainable about broad-scale clearcuts! We envision a model where the uplands are restored to native longleaf pines (never to be clear-cut), and moister sites are farmed for bamboo (also never to be clear-cut). In this model, the farming of bamboo for paper, pulp, etc. could remove some of the pressure to clear-cut pine plantations and possibly encourage the sustainable management of pine woodlands for timber, recreation, wildlife, environmental, and aesthetic values. We are experimenting with this model on a small scale here. We also want to make it clear that we would NEVER advocate introducing bamboo (or any other exotic) to a pristine longleaf-wiregrass ecosystem or any other undisturbed native habitat. However, the fact is that such habitats are few and far between and most of our land has been disturbed and modified. We ARE advocating the transition of agricultural fields which are plowed and sprayed yearly (multiple times) to a permanent crop which has many potential uses, is rapidly renewable, and will protect and improve soil, air, and water quality. What will it take for bamboo to become an accepted farm crop in the US? With all its advantages, bamboo is at a disadvantage in terms of the lack of subsidies and lobbyists which prop up "conventional" crops such as cotton and pine trees. Most farmers want to be good stewards of their land, but current agricultural policies make it almost impossible to do so and still make a living. Instead of waiting for the slow ship of bureaucracy to change course and promote more sustainable crops, small farms can begin growing bamboo now for edible shoots with an eye towards the longer-term goal of marketing bamboo for its many other uses. Larger farms with land that is marginal for other crops could also realize short- and long-term benefits from planting bamboo even if marketing edible shoots isn't a priority. Already, there have been a few larger plantings of bamboo for edible shoots in the Southern US. We expect this to become a trend as more small farms become aware of the many benefits of growing bamboo. As our field stock of bamboo expands, we plan on marketing edible shoots in addition to the plants and poles we currently offer. We also have a longer-term goal of marketing bamboo for industrial use and would like to network and consult with others interested in growing bamboo as a farm crop. Whether you are a small farm looking to integrate bamboo into your operation, or a larger farm with idle acreage, we can recommend the best bamboo varieties for your site and your future goals. As South Georgia's only bamboo farm & nursery, we have a unique understanding of the best species for our area and their cultural requirements in our climate and soils. We also have experience growing bamboo in other areas of the southern US. Below are several considerations for anyone considering bamboo as a farm crop. Clumping vs. Running Bamboos: For most of the Deep South, running bamboos will attain larger sizes than clumping bamboos, and thus will produce the larger-diameter shoots and poles that are generally more desirable. This is not to say that the clumping bamboos can't be farmed for shoots and poles…..they just won't attain the same size as the runners. The exception to this would be the tropical and near-tropical areas of the US, where the clumpers may actually attain giant proportions and many of the running species will suffer without a "winter break". Generally, for a farm-type setting where there is ample room for a bamboo to spread, we would recommend one or more of the running varieties. For smaller holdings, where available space is an issue, it might make more sense to cultivate clumping varieties, although the clumpers are also less cold-hardy, another important consideration. Site Selection: Most bamboos are extremely drought-tolerant once established, although they will spread faster and attain larger size with supplemental irrigation during dry periods. When there is a choice, we recommend planting bamboos on moist, low-lying sites. Although the soil still needs to be well-drained, temporary flooding is generally OK and some bamboos perform better than others on sites that remain water-logged for extended periods. For drier sites or larger-scale plantings, we recommend supplemental irrigation for at least the first year to get the plants established and off to a good start. Also, some bamboos are more drought-tolerant than others, so be sure to consider your site's water availability when deciding which bamboo(s) to grow. Bamboo Species Selection: Selecting the right bamboo for your goals is very important. Although the above two considerations help determine which bamboo(s) you plant, there are many other factors. If you are interested in only producing shoots, Phyllostachys vivax and Phyllostachys dulcis (Sweetshoot Bamboo) are the fastest to produce large-diameter shoots (but their wood is of an inferior quality). If you want to produce shoots AND poles and potentially market bamboo for industrial uses in the future, then one of the larger timber bamboos such as Phyllostachys edulis (Moso) or Phyllostachys bambusoides (Japanese Timber Bamboo) have better wood quality and are more desirable from an industrial standpoint, but are slower to attain large sizes. Other bamboos that don't get quite as large are more desirable for other purposes. With this in mind, growing more than one bamboo species gives you more options and can also extend your shoot-harvesting season (different bamboos have slightly different shooting cycles). Having more than one bamboo also protects you in case the bamboo flowers. Bamboo flowers only rarely and is mostly unpredictable, but it can lead to the death of the grove if it flowers and sets seed. Sometimes the bamboo will flower, not set seed, and recover. 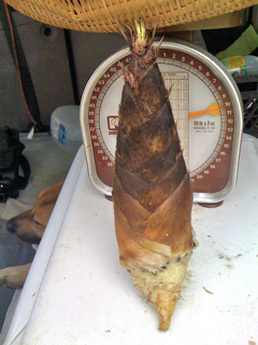 If it does flower and seed, the bamboo may regenerate from seed in the original location. In either case, production from that grove may be lost for a long period. Having more than one species of bamboo protects the grower because different species are on different flowering cycles and will almost certainly not flower at the same time. Your local climate is the other important factor in selecting the right bamboo: cold-hardiness among the running bamboos varies greatly. Sunlight: The larger-growing varieties of bamboo generally prefer full sun, but also do very well in light, open shade. We have started several groves in the shade of recently-thinned planted pines. We anticipate thinning the pines once more in a few years and then letting the bamboo fill in selected areas underneath the remaining pines. The light shade was helpful in getting the bamboos established with a minimum of supplemental water. The bamboos will actually size up quicker with a little shade, as they will stretch for the sunlight. However, the number of canes produced each year is generally fewer than a grove in the full sun. Plant Spacing: When considering plant spacing, remember that you can start with one plant of a running bamboo species and it will eventually cover considerable ground if left to grow unrestricted. However, if you plan on marketing your bamboo in the near future, you will most likely want to start with more than one plant. The number of plants you start with and their spacing relative to each other is determined by a variety of factors, including your budget, available space, and anticipated demand for your bamboo. If you live near an urban area with many dining options, your prospects for selling fresh shoots to local chefs and possibly at farmer's markets will probably be much greater than someone who resides in a rural setting far from any population centers. That being said, for most field plantings of bamboo intended for shoot/pole production, we would not recommend planting any closer than ten feet apart. The one advantage that closer spacing might give is in weed suppression as the bamboo will close the gaps and shade out weeds faster. Most of our groves were started using fifteen foot spacing. Please note, bamboo used for privacy screens is usually planted on a closer spacing (5-8ft. apart), something to consider if your production groves are also intended to serve this purpose and you need a screen sooner rather than later. Establishment Time: With bamboo, as with most perennial crops, it will be a few years before your first harvest. Depending on the type of bamboo and the cultural factors under which it is grown, your first shoot harvest is probably 4-5 years away. Your first pole harvest will likely be a few more years, also depending on the intended end use for the poles. Keep in mind that after the initial harvest, the harvest from a well-managed bamboo grove should increase every year until the bamboo reaches its maximum size and has filled the available space. By now, you have probably realized that farming bamboo is not a get-rich-quick proposition. However, we feel that it represents a great opportunity for American agriculture to transition away from the current, unsustainable status quo. Landowners with the foresight to plant bamboo now will be ahead of the curve as the global market for bamboo continues to grow. We would be happy to discuss these and other considerations in greater detail with anyone who is interested! Daphne Lewis, author of Farming Bamboo.